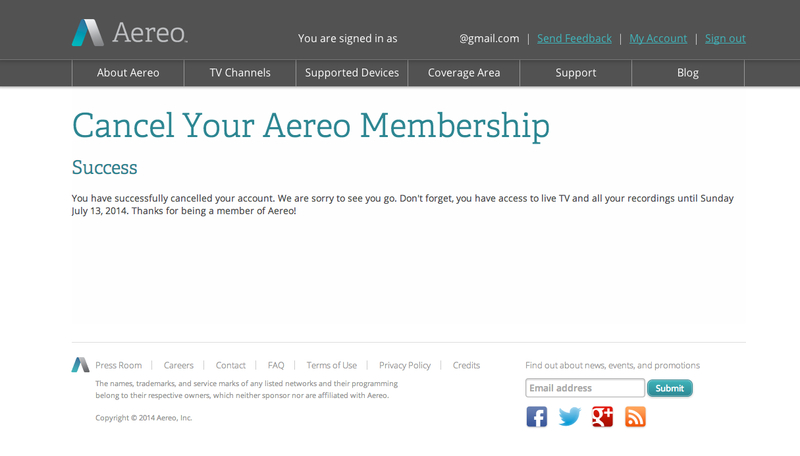 Until yesterday, I was an Aereo subscriber. My family lives in a fairly large co-op apartment complex in Upper Manhattan. Our building’s residents have collectively contracted for our own broadband internet service, so we get a cheap, reliable high-speed connection without having to deal directly with a cable company or purchase all their bundled services at retail. For entertainment, we pay for subscription streaming services like Netflix, Amazon, Hulu, and Spotify, supplemented with occasional purchases of content not available to stream. Collectively these subscriptions actually cost us quite a bit less than the basic cable TV package offered by our local monopolist, TimeWarner Cable (soon to be Comcast), and offer more variety, convenience, and reliability. One thing we don’t get from this array of IP-based streaming services is live broadcast television. So a few months ago I purchased a digital TV antenna to catch the occasional live sporting event, pbs kids show, or network drama. But our apartment is on a low floor, in a hilly area of the city, surrounded by other late Art Deco-era buildings all built of steel and thick poured concrete sheathed in brick and stone. No matter where in our apartment I put the antenna, I couldn’t pick up the over-the-air broadcast TV signals being transmitted from just a few miles away in midtown Manhattan–signals that are reliably received in homes across the street, or a few stories above mine, or in less-densely built areas as much as eighty miles away. If I were able to pick up such transmissions using the antenna I bought, copyright law would afford me the right to view the broadcasted programs in my home with “a normal circle of a family and … social acquaintances“, and even “time-shift” by recording them for viewing later. But my television set is in a physical space that happens, due to particularities of the physics of the propagation of electromagnetic waves, to differ from the physical spaces all around it in that broadcast TV signals have particular trouble reaching it. Aereo’s system is made up of servers, transcoders, and thousands of dime-sized antennas housed in a central warehouse…. [O]ne of Aereo’s servers selects an antenna, which it dedicates to the use of [a] subscriber (and that subscriber alone) for the duration of the [subscriber’s] selected show. A server then tunes the antenna to the over-the-air broadcast carrying the show. The antenna begins to receive the broadcast, and … Aereo’s server begins to stream the … show to the subscriber over the Internet. Two commentators I admire and respect have written (here and here) that this system can be seen as analogous to a homeowner putting their TV antenna on the roof of their house to get better reception. There’s a bit more to Aereo than that, but truly, that’s all my family wanted: an antenna in a more suitable location than our living room, with a wire connecting it to our TV. We signed up. Yesterday the Supreme Court decided that city-dwellers like me who use Aereo’s remote antennae are more like cable customers subscribing to a common antenna than like suburban homeowners who put antennae on their roofs, and that Aereo is more like a cable company than a property owner renting us some useful space and equipment. Justice Breyer’s decision for the majority was deeply purposivist, relying on an interpretation that the community-antenna (CATV) provisions of the Copyright Act of 1976 reflected a broad-brush Congressional policy about what types of uses of broadcasted content require a license. Those policies appear to depend less on “technological difference[s]” than on social ones–the different permutations of arrangements between content owners, users, intermediaries, and the physical resources under their control. The key phrase in the opinion, to my mind, is the one that implies that families like mine “lack any prior relationship to the [copyrighted] works” transmitted over the air by their broadcasters. To be clear, my relationship to the works is based on real estate: I own a home situated a few yards away from where television broadcasts can be pulled from the air, for free, by means of a consumer-grade antenna. This appears not to be the type of relationship that the Supreme Court thinks entitles me to contract with a third party for the use of nearby real estate and equipment to pull those same broadcasts from the air. As a consumer of entertainment content, this conclusion strikes me as a minor inconvenience–the content is not worth that much to me, and I suppose I will simply go without it now. As a law professor though, the conclusion strikes me as…curious. Most commentators are focused on the implications of the Court’s ruling for cloud-based services, and that is an interesting question. But for me the more interesting question is what Aereo says about the framework of laws and practices by which we allocate responsibility for the creation of new knowledge. In the classic telling, copyright is a tool by which we purport to satisfy a social obligation to creators of new works of authorship. Depending on whom you ask, this obligation is either a collective obligation to establish appropriate incentives for authors, or a moral one in recognition of the authors’ desert or dignity. Aereo certainly didn’t call into question whether such an obligation exists, and I don’t either. My question is how a society allocates among its members the burdens of satisfying that obligation. This is a question that, as it turns out, is occupying a lot of my research and thinking lately. Through a combination of the principles of electromagnetism played out across the natural and built environment and the historical accidents of technological progress and time-worn statutes, we seem to be in the position of allocating the burdens of supporting authorship at least in part via the real estate market. That seems to me an arbitrary basis by which to allocate these burdens. Indeed, it seems so arbitrary that there must be some quite important reason why the Aereo majority–which took a rather free-wheeling approach to determining statutory purpose–would feel the need to preserve it. Understanding what those reasons might be is a bigger project than a blog post can contain. I will continue to work on the problem. For now though, I think I’ll watch some TV.